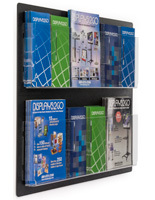 Easily the best-selling displays with our customers, what's the common denominator that these products all share? 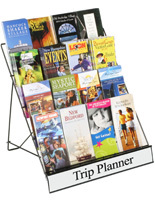 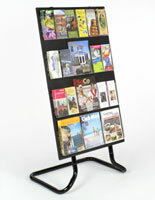 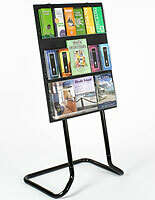 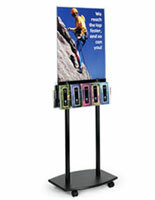 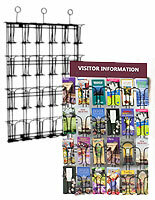 Black brochure holders feature the most popular finish bar-none. 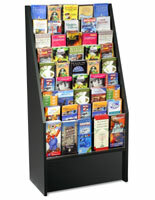 The neutral color makes for a handsome background on which to display and present takeaway literature. 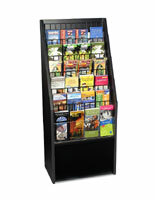 Additionally, black also blends in with virtually any interior decor, whether on the floor, walls, or tabletops. 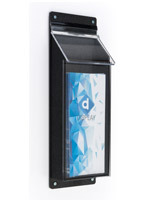 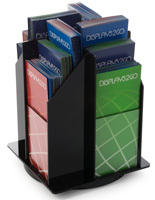 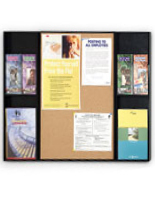 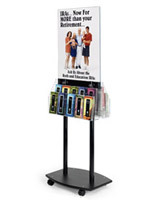 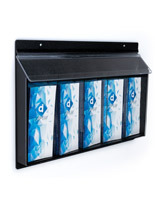 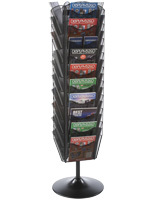 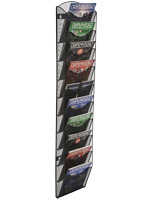 This collection of black brochure holders is constructed from three main materials: wood, metal, and acrylic plastic in a wide variety of single and multi-pocket stands and racks. 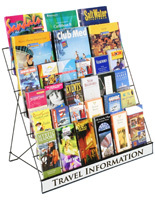 What styles of literature racks are available in each material construction? 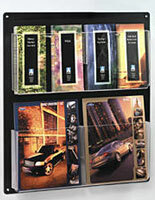 Black brochure holders in acrylic plastic make up the bulk of these offerings and the material provides a glossy look. 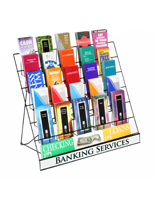 Countertop tri-fold displays feature tiered stacks of pamphlets as well as rotating spinners that can hold a large amount of flyers in a small footprint. 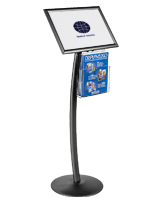 Floor stands usually come with sign or poster frames with an area below for takeaway brochures, suitable for mallway and lobby display. 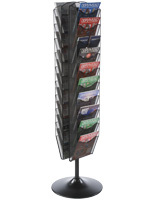 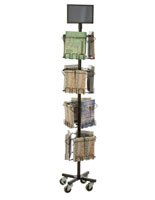 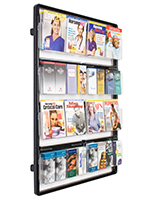 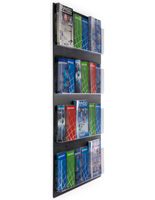 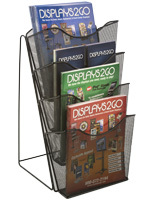 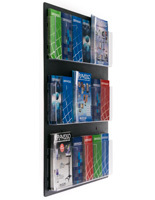 The wall racks offer more display options since many models come with removable dividers that create larger pockets for displaying magazines or catalogs. 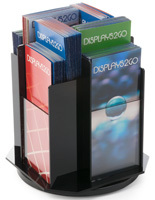 Wooden brochure displays add more warmth and style to the presentation. 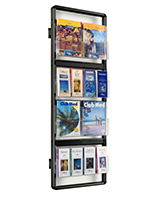 Due to their design and construction, wood stands and racks are more labor intensive and therefore are usually purchased for more upscale environments. 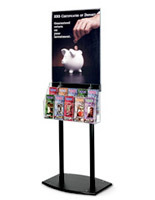 Styles include handsome floor kiosks with poster displays and large tri-fold units that can hold up to 45 individual pamphlets. 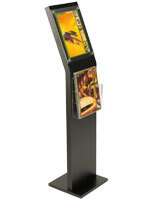 The black finish on these wooden fixtures comes in the form of durable plastic laminate. 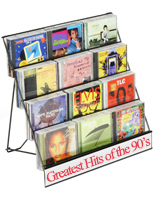 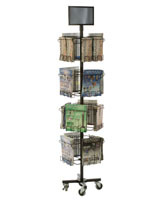 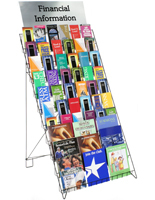 Metal literature racks are available in steel or aluminum iterations. 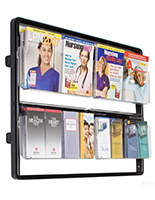 The steel models feature black wire frame construction with some pockets made from wire mesh for a clean and contemporary appearance. 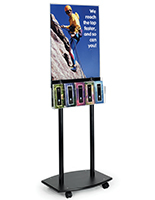 Extruded aluminum is the material of choice for floor stands and in this case the black coloring is achieved with an anodized finish. 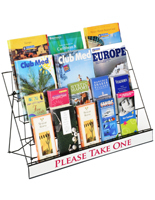 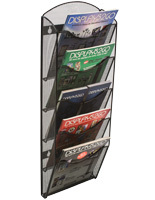 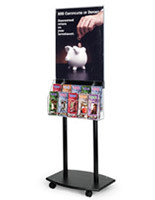 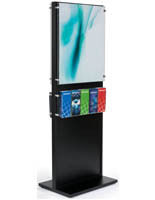 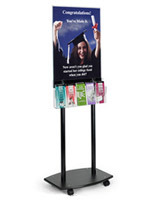 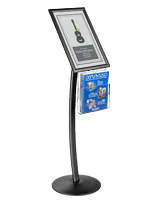 The aluminum support posts act as the backbone for many brochure stands with either steel or acrylic literature pockets as the added accessory. 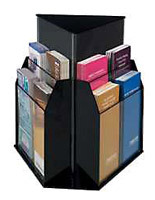 The choices are many, but if you are in the market for retail brochure displays with black finishes you have come to the right place! 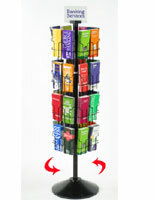 We stock the largest selection online and offer same day shipment on purchases ordered by 3PM EST. 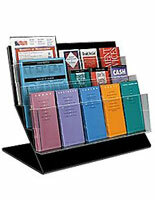 The advantage of buying literature holders in the same color provides a consistent appearance across the board. 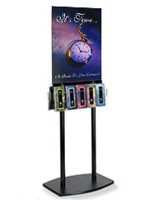 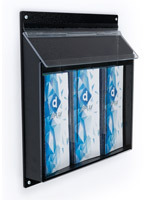 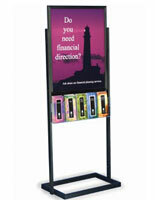 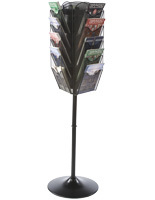 Organize your business while marketing your services at the same time with these black tri-fold fixtures.